September 2016 is the 12th month in a row of record-braking temperatures. A year of record-breaking temperatures. Our planet is heating up. Every month since March 2016, I’ve posted an article that is almost exactly the same every time. For the nth month in a row, I’ve written, we’ve had a month that broke the temperature record historically. And even when I wrote the first one in March, we’d already seen record months since October of 2015. And it’s happened again. 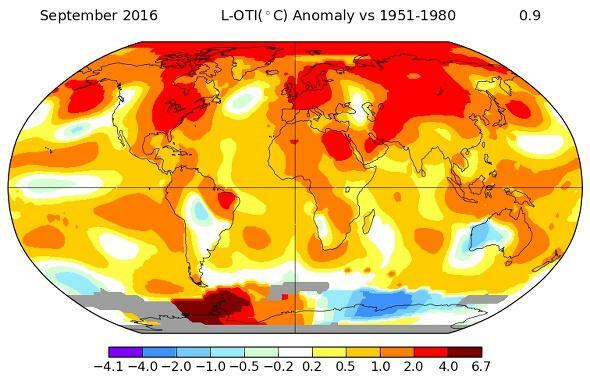 September 2016 was the hottest September on record. That makes it the 12th month in a row this has happened*. After repeating the same article nearly word for word every month since March, I just can’t do it again. It seems too glib this time. We’ve had a year of record heat. A year. To be fair, this September just barely beat the previous record holder, by 0.004 degrees Celsius, putting it essentially in a statistical tie. But the previous record was in 2014, which again shows you that the world is heating up; all the record high temperatures are recent. The only way to even be a record high these days is to beat out some record from a year or two before. The world is too damn hot. It’s a foregone conclusion that 2016 will be the hottest year ever recorded. This latest record—all the recent records—are not individually critical. But we see so many of them that they should trigger warning bells in your head. And when you see the trend—a paper recently published by climate scientists claims that the Earth is hotter than it’s been in more than a hundred thousand years—those bells should be clanging louder than anything else. Global warming is an existential threat to our species. So why is it we had three presidential debates with only barely a mention of this? And why do we have flat-out deniers still sitting in Congress? Here’s a bit of good news: A total of 469 seats in the U.S. Senate and House are up for re-election on Nov. 8. Better yet, many vulnerable seats in the Senate are held by Republicans, the party that is far and away the most responsible for climate change denial in Congress. It’s literally in the party platform for the GOP. That makes the Senate up for grabs for the Democratic Party, and a lot of the House as well. Even such stalwarts of GOP denial as Rep. Lamar Smith (R-Texas) are not looking as solid as they once were; for the very first time, in Smith’s home town the San Antonio Express-News refused to endorse him because he’s using his power as a congressman to bully scientists about climate change. His rabid denial has led him to abuse his position, and as the newspaper has shown, whether you agree with him or not, this alone is enough that he should be kicked to the curb. I’ll note that his opponent this election is Tom Wakely, a Democrat. While Smith is probably safe, perhaps in two years a more moderate Republican who understands science will see his or her opportunity to unseat him. I dearly hope so. I need not go into detail on the horrendous threat Donald Trump poses to our nation and our planet. But have no doubt that down-ballot candidates are every bit as dangerous. Denying global warming is as fundamentally wrong as saying the Earth is flat. It’s long, long past time to vote those flat-Earthers out of power. Go out and vote. It’s not too late. *Correction, Oct. 26, 2016: Several people brought to my attention that GISS reanalyzed the data and found that June 2016’s temperature was lower than first thought by 0.05° C, making it the third hottest June recorded by a small margin. I missed this when I read the webpage. However, as I say in this very article, the actual records aren’t as important as the trend. And that trend is heading up. My overall point remains true.